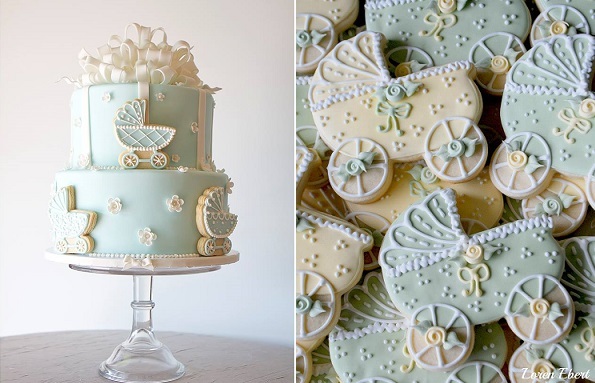 One of the most chic and elegant cakes for a baby shower or baptism is a vintage pram cake or baby carriage cake. 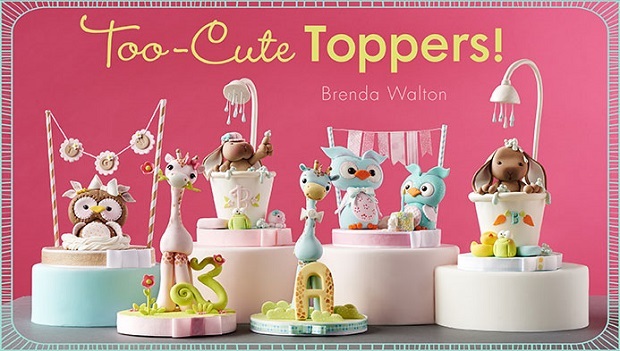 And we have a selection of some of the most beautiful from leading cake designers to inspire you this week. 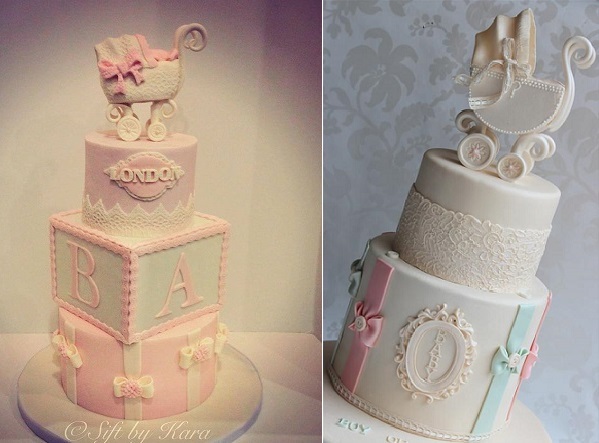 Soft pink, lace and bows adorn the beautiful pram cake above by Sift by Kara (left) and on the right, Kim Stubbins of Cake by Kim, Australia has crafted a superb vintage style baby carriage for an exquisite christening cake dressed in pink and blue bows, with a beautifully framed sugar plaque for extra touch of baby chic. 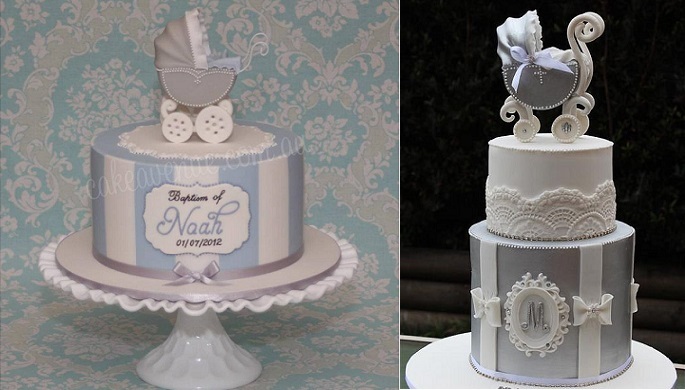 Shades of baby blue and grey make a chic christening cake/baby cake below in one of the signature designs of Australia’s Cake Avenue (below left) and to the right, a vintage pram cake in antique silver by Cake by Kim. 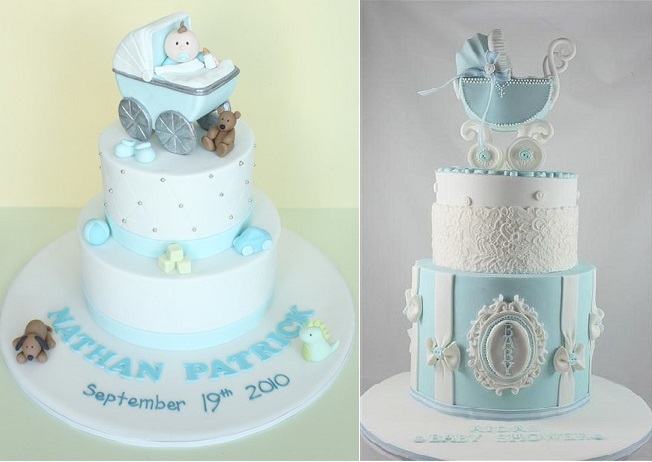 Sharon Wee has created an adorable baby carriage/pram cake below left in her unique playful style and on the right, Cake by Kim’s beautiful design in baby blue. 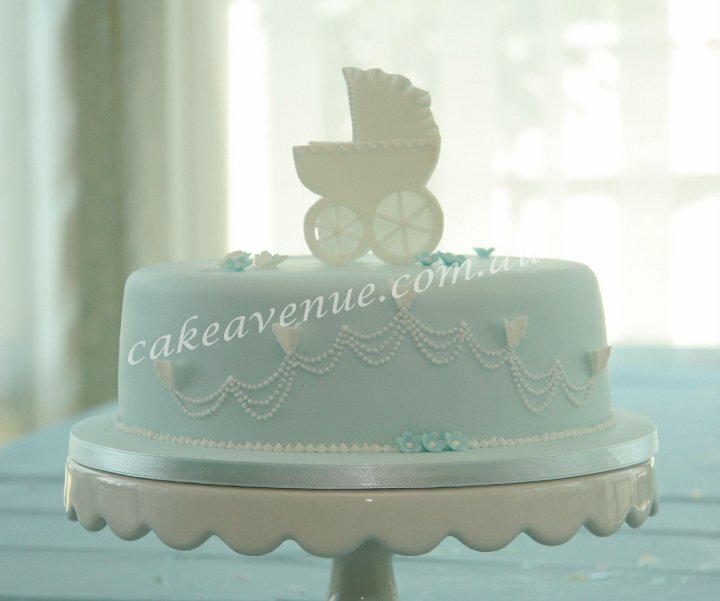 A superbly simple and elegant take on their vintage pram cake by Cake Avenue below. 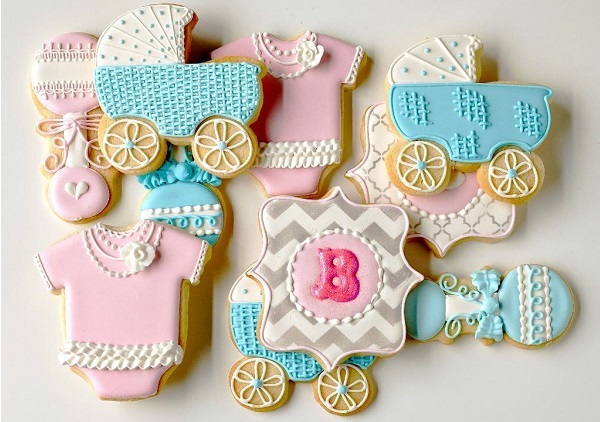 The Pastry Studio have used the softest shade of powder blue for their beautiful creation (below left) creatively decorated with pretty baby carriage cookies and on the right, more exquisite baby pram cookies/iced biscuits from Loren Ebert of The Baking Sheet. 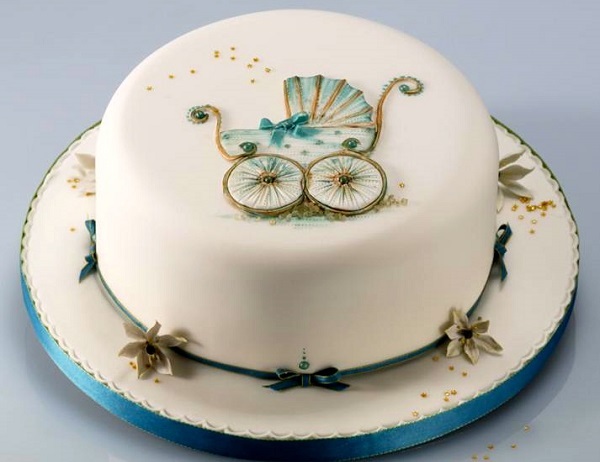 A fabulous antique style vintage pram cake below by Alan Dunn Sugarcraft for a beautiful, old world style cake. 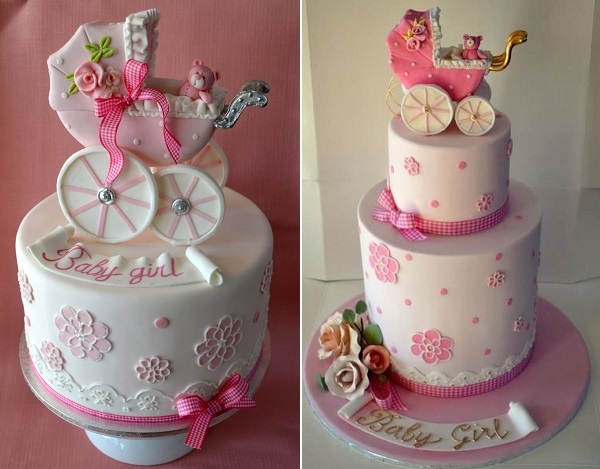 Pretty floral and exquisite handpainted details create magnificent baby cakes below adorned with vintage pram cake toppers by The French Confection Company. 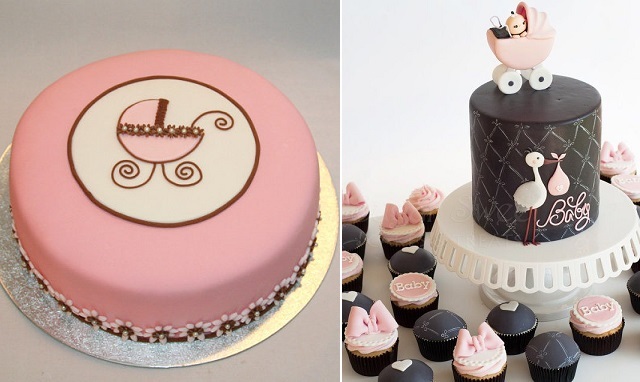 Two very pretty in pink pram cakes by Trina Thomson of Sweet Ruby Cakes, Australia feature below. 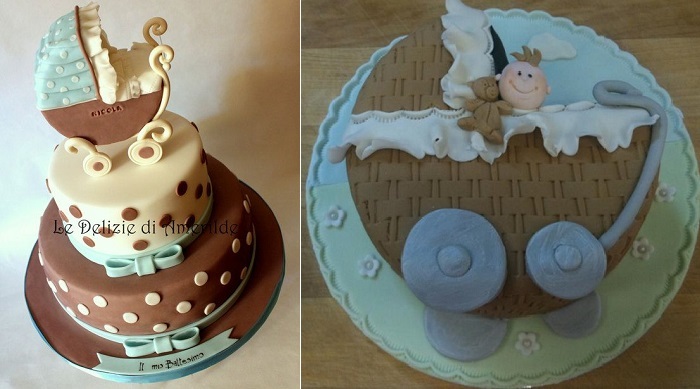 Simple blossoms add a delicate touch of prettiness to the beautiful baby carriage cakes below by Sweetness Boutique Cakes & Confectionery (left) and Bubolinkata Cakes (right). 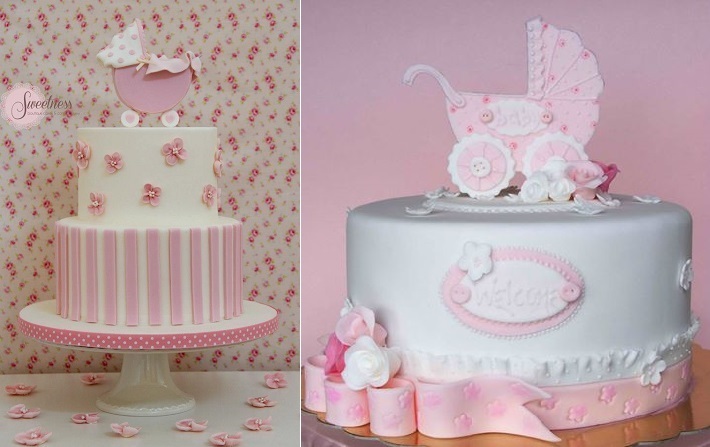 Pinks and browns create a fabulous colour combination (especially if there’s chocolate cake underneath) in the two delightful vintage pram cakes by below via KakeFesten.com (left) and Sugar Sweet Cakes & Treat (right). 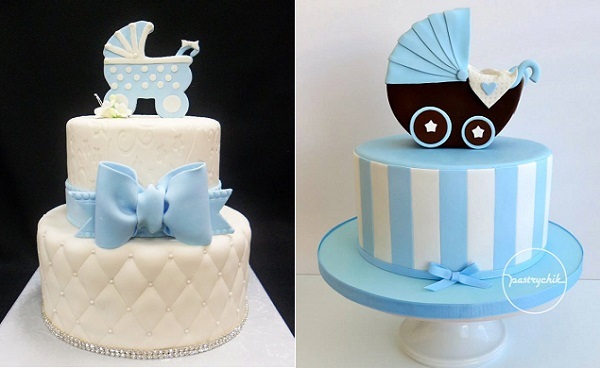 Equally, shades of blue and brown make a stylish combination for a christening cake for a boy with beautiful vintage baby carriage cakes below by Le Delizie di Amerilde (left) and A Touch of Magic, Ireland (right). 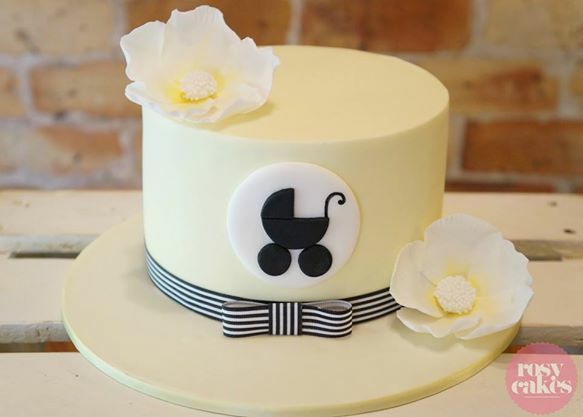 Pale lemon makes an exquisite backdrop for this elegant vintage pram baby cake by Rosy Cakes, New Zealand. 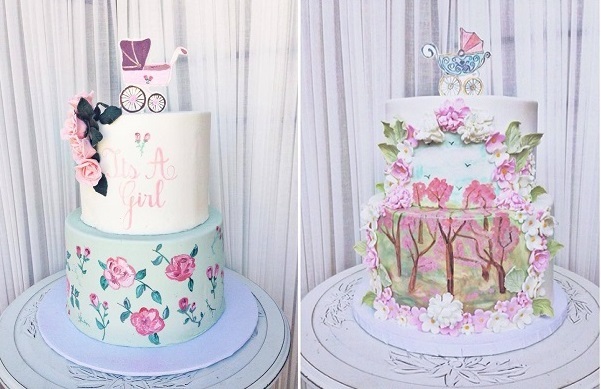 Quilting effects and stripes make pretty side designs paired with baby blue bows in the two beautiful vintage pram cakes below by Cake Studio LA (left) and Pastrychik (right). 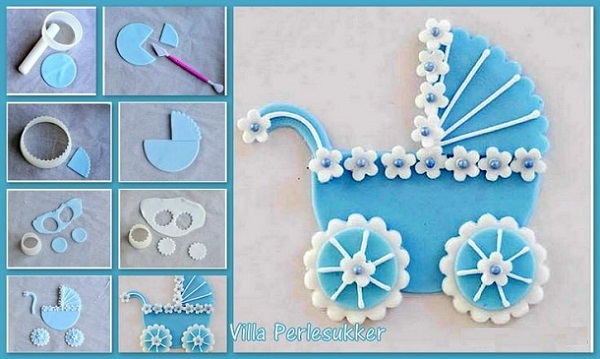 A fantastic 2D vintage pram cake topper tutorial from Villa Pearl Sugar, below. 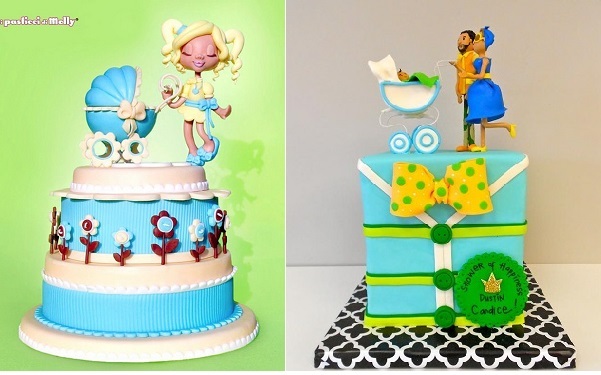 An elaborately modelled vintage baby carriage cake complete with a superb mom cake topper by sugar artist, Molly Coppini (below left) and on the right, a fantastic comtemporary style baby carriage cake with both mom and dad by Artylicious Cakes. 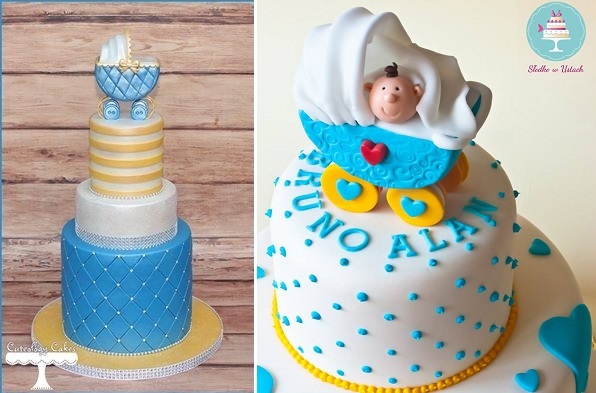 Pearlised blue quilting adds a fabulous touch to the vintage baby carriage cake topper below in a cake design by Alyssa Hall of Cuteology Cakes (left), and on the right, a mischievous little baby peeking out of his cute carriage in a beautiful design by Slodko w Ustach, Poland. 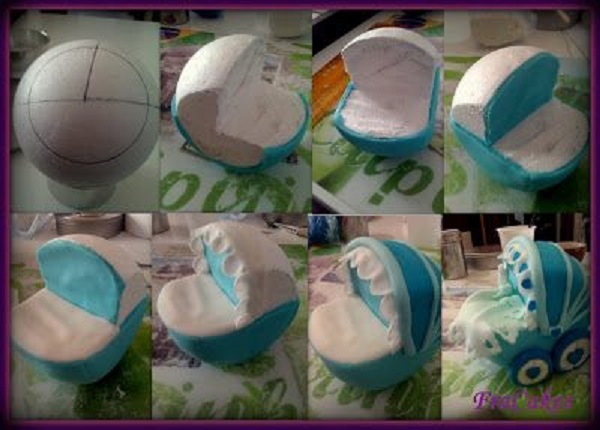 FraCakes have created a picture tutorial below demonstrating how to create and carve a simple 3D baby pram cake for a very effective baby shower or baptism celebration centrepiece. 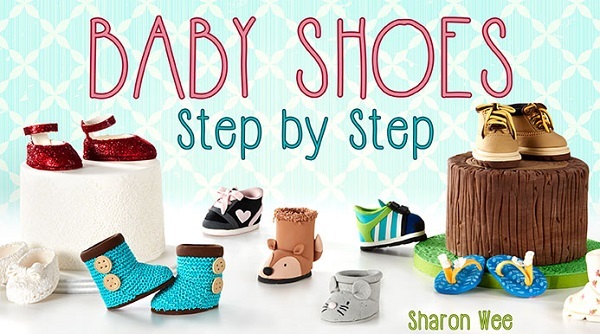 Join the Cake Geek Magazine Facebook Page here for news and updates on cake style and trends.